When your pasta machine starts to squeak or your pasta starts to appear discolored it may be time to lubricate your pasta maker. Learning how to properly lubricate your pasta maker will prolong its use. Lubricating your pasta maker is a very simple process which will save you time and money. Take apart your pasta maker. Pull up on the pieces sliding it along the tracks. Use the brush to remove any particles on the pasta maker. 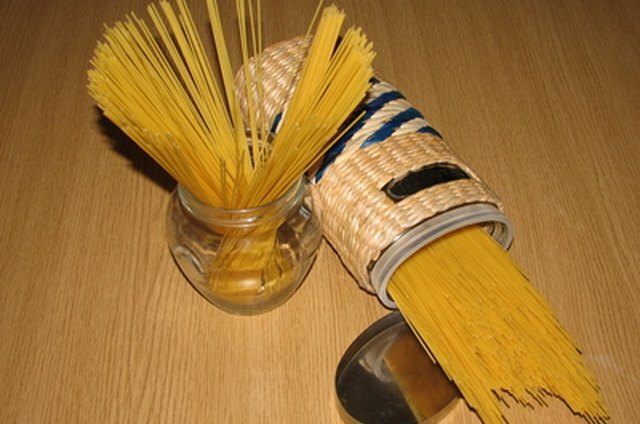 Brushing all the pieces of your pasta maker cleans and removes debris from the components. Make sure the brush is dry. Do not use any water or detergents on your pasta maker as this will cause the metal to oxidize and rust. Locate the ends of the cutting rollers and place two to three drops of mineral oil on each end. Reassemble the pasta maker. Camille Baron began freelance writing in 2007. She has written for various online publications over the years. Her areas of expertise are health and nutrition, beauty and electronics. Baron received her Associate of Arts at Wayne County Community College in 2004. She is currently working towards her Bachelor of Science. How to Get Rid of Pasta That Is Stuck to Bottom of Pot?